“Great!” I thought. He’s going say something positive about the technological savvy of grandmothers (based on some actual evidence) and reference Grandma got STEM, which is why ggstem is getting hits. Unfortunately, my hopes were dashed. This mass market is comprised mostly of people who sit in the middle of the tech-adopter bell curve, and since they aren’t product designers, computer programmers, and tech bloggers, they require an even higher degree of simplicity. Yes. All kinds of people sit in the middle of the tech-adopter bell curve. All kinds of people aren’t product designers, computer programmers, and tech bloggers. People gain and lose cognitive function at a variety of rates for many different reasons. Please let’s use the criteria above to describe 2 billion potential users, rather than make assumptions about their gender, age and maternity. David seems to be making an argument for good design and usability testing. But when he suggests how to identify a group of users to test products, here’s what he says. So David’s company tested software on drunk people and he seems to assume that testing on old (and very young) people would yield approximately the same results. How do these assumptions about cognitive overhead affect his judgement when “old” people apply for jobs at his company? To end on a positive note, one of the comments responding to the post is a quote from ggstem with a link to this blog. 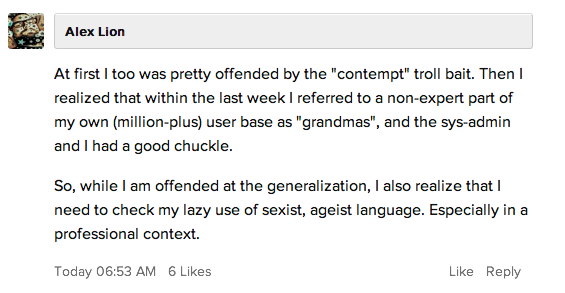 So people reading David’s post are coming here to see what’s really up with “old” people and STEM. Thank you to fubarator, who posted the ggstem quote and link. I want to emphasize that I don’t think David is being intentionally malicious. He is trying to argue for tech design that all users will find approachable. I hope he will enjoy learning about the incredible contributions of grannies on this blog. And I hope people in his position will begin to practice new ways of describing their novice users.